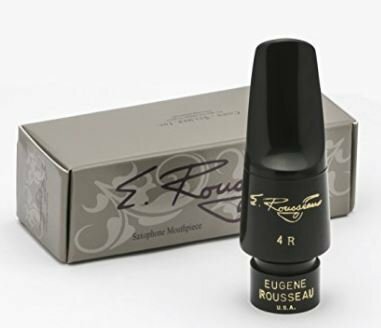 The E. Rousseau Classical models provide for appropriate tone application, responsiveness and projection necessary for both traditional and modern classical performance. All classic models provide an opportunity for freedom of expression in all registers while maintaining a truly beautiful saxophone tone. NC is “New Classic” one of six mouthpiece designs in the E. Rousseau line. This design provides for superior tone, responsiveness and projection for most advancing student players. It promotes a full range of tonal colors and excellent tonal center. The New Classic is designed for natural reed fit and easier tuning. The “4” indicates Medium facing (distance between reed and mouthpiece tip). The NC4 is the preferred model and facing for advancing concert band saxophonists. *DOES NOT INCLUDE Ligature or Cap.